Austmarr 'Eastern Sea' is an Old Norse name for the Baltic Sea (cf. Modern Swedish Östersjön, German Ostsee, Finnish Itämeri). (In Estonian, the Baltic is called Läänemeri or 'Western Sea'.) The name Austmarr appears in the ninth-century poem Ynglingatal by Þjóðólfr ór Hvíni, cf. Skaldic Poetry of the Scandinavian Middle Ages. The design is inspired by the thirteenth-century wooden vessel found on the grounds of Åbo Akademi in Turku, Finland, in 1997, which bears a runic inscription in Latin: auemariagr. (The prayer continues on a second line above the first.) More information about this find (in Finnish), including a photograph of the inscription, is available at http://www.kasvatus-ja-aika.fi/site/?page_id=138 (Kuva 4). A Christian prayer in Latin in a runic inscription from Finnish territory represents several of the cultural strands in synergy in the Baltic region. 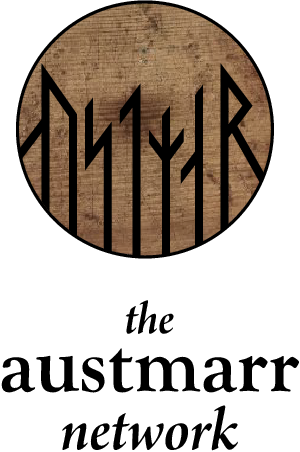 We modified the runes to read Austmarr, taking advantage of the numerous shared letter forms. The graphic composition of the logo is courtesy of Christopher Sellers, chrissellers.com.